This rendering, provided by the Green Bay Packers, highlights the 6,600 seats that will be added to the south end zone at Lambeau Field in a four-tiered structure. The addition, part of a $130 million project funded by the team, is expected to be ready for the start of the 2013 season. 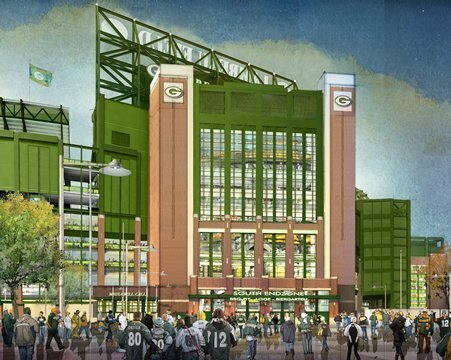 This rendering shows the new gate at the south end zone of Lambeau Field that is part of a $130 million project expected to be completed for the start of the 2013 season. GREEN BAY — Lambeau Field is getting bigger without a big bill for Brown County taxpayers. The Green Bay Packers will add 6,600 seats to Lambeau Field, and the team will cover the cost. It also may offer a stock sale to help pay for renovations. The team will add two entrances to the stadium, near the north and south scoreboards, in addition to the previously announced replacements of the sound system and the scoreboards. It will also build a viewing terrace for club-seat ticket holders on the north end zone roof. The total cost will be about $143 million, and the projects are expected to employ more than 1,600 workers with a combined payroll of $70 million. "It does keep Lambeau Field up to date," said Mark Murphy, president and CEO, during a news conference Thursday. New seats, to be stacked on four levels over the south end zone, will be offered to existing season-ticket holders first. If they choose to move, season-ticket holders will have to give up their existing seats. Those seats will then be sold to people on the waiting list of 87,000. The additional seats will increase capacity to 79,000, making Lambeau the NFL's fourth-largest stadium. "You'll be up high, but not very far from the field," Murphy said. All of the seats will be outdoors, but concessions and other amenities will be in an enclosed concourse. The new section will be different from any other in the stadium, but Murphy said it will be designed to fit in. "We want to make sure everything we do is consistent with the current stadium," he said. The expansion also is designed to increase fan noise. Wied said the walls behind the addition will be metal, designed to direct noise back into the bowl. A rooftop terrace will be built above the north end zone. Club-seat ticket holders will have access to the terrace, which will be available on non-game days for meetings and receptions. "There could be weddings up there. It will be quite a view," Murphy said. 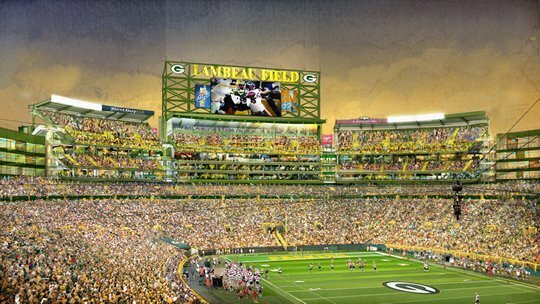 The Packers will replace existing scoreboards with Mitsubishi Diamond Vision video boards. The team already installed an improved audio system. The changes to the stadium won't alter the ticket-lottery program, which makes 4,000 seats available to Brown County residents every year. The Packers are "fairly far along" on a stock sale, said Jason Wied, vice president of administration and general counsel. "There are still a few hurdles," he said. The team has received many requests for stock since the last sale in 1998, which raised more than $24 million, he said. The NFL as well as state and federal regulators must approve a stock sale, which would be the fifth in the team's history. Wied said a per-share price has not been determined, but in the most recent sale, in 1997-98, shares were $200 each. At present, 112,158 shareholders own 4,750,937 shares of stock, which do not pay dividends or increase in value. Ownership is limited to 200,000 shares per individual. The Packers scheduled a groundbreaking for the project on Sept. 1, but the bulk of the work will happen during the 2012 and 2013 offseasons. The new seating is scheduled to be available for the 2013 season. The economic effect of the increased capacity is estimated to be more than $1 million per game in out-of-county spending, or $11 million a season, excluding playoff games, said Ann Patteson, chairwoman of the Green Bay/Brown County Professional Football Stadium District. That's about equal to an extra game per season. An economic impact study commissioned by the stadium district estimated the annual economic impact by out-of-town fans in 2009 was $282 million, or about $12 million per game. The combined projects are expected to employ more than 1,600 workers with a combined payroll of $70 million. Miron Construction of the town of Menasha will be the contractor. Miron was a prime contractor on the stadium renovation in 2003. Wied said the project will use as many local workers and subcontractors as possible. Hammes Co. Sports Development of Madison will be project manager, as it was for the 2003 renovation. Elkus Manfredi, a Boston firm, is the design architect. Patteson said the impact of construction and increased capacity could allow the 0.5 percent Brown County sales tax to be retired a couple of months earlier than expected. The tax will not fund the expansion. The tax, which helped fund the $295 million renovation of Lambeau Field in 2003, is expected to be retired in 2015. All bonds have been paid off and the stadium district is accumulating money for maintenance and operation costs through 2033, the end of the Packers' lease. "This will be a return on investment that goes on every year for the life of the stadium," Patteson said. Contact Richard Ryman at rryman@greenbaypressgazette.com and follow him on Twitter @pressgazetteBIZ. For Hammes Co. President Robert Dunn, the $130 million, 6,600-seat Lambeau Field expansion is a chance to finish what he started. The team would use proceeds to help fund the $143 million expansion and renovation project to Lambeau Field that it announced in August.